Every day, hundreds–thousands!–of articles are written which offer “solutions” to the world’s problems. Many of those claimed solutions involve some sort of POLITICAL action. OR maybe it just seems that way because the USA is in an election year. 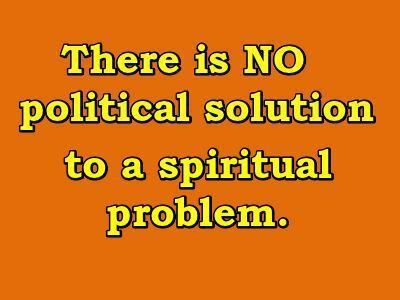 There is no political solution for a spiritual problem. However, even those who inhabit the churches many times fail to see the nature of the problems which confront the USA (and the world) as spiritual problems. Most are intent on the trees and fail to see the forest. This denial of the nature of the problems which beset the USA and the world will be used against mankind when the man of sin makes his entrance. The world will be asked to “return to God.” Instead of God Almighty, the world will be deceived into turning to the dragon (Satan) and his false messiah. The world will then get a heavy dose of man-created solutions to the overwhelming spiritual problems which will plague the world in the last days. Even when the problems are plainly spiritual, end times man will twist himself into a human pretzel to deny this. It doesn’t matter how many Bible verses one tries to explain away: doing so only confirms that the problem is spiritual. Christians are supposed to be “in this world, not of it.” Yet, so many church-goers are neck-deep in the world and are calculating what they must do in order to maintain their worldly position–even as their world collapses. Therefore, they will support what feels good to their flesh–all the while trying to justify their decision with a Bible verse wrenched out of context. Better that they should come clean with themselves. THEN, they would only have to concern themselves with the consequences of “rebellion” and “pride”–instead of adding “self-deceived” to the mix as well. Does the reader want to know whether he is self-deceived? Pray to God Almighty to not be deceived. God will honor the honest prayer.